With Callisto clients are delivering powerful financial reports, gathering forecasts and budgets with incredible ease and speed. The user interface is tightly integrated into the native Excel that business users know and love. Administration is performed by the business users in the Modeler that offers unprecedented ease of use. Callisto users can build their own systems with things such as accounts, departments, products, etc. changing before their Ledger system for forward looking operations such as building a new budget for next year, while still reporting against the existing structures for this year. For other clients, their Callisto system is tightly integrated into existing General Ledgers to just automatically generate a new reporting system to get started easily and quickly and then automatically stay in sync without the need for independent maintenance. Partners deliver highly functional system templates that can be used out of the box with extension and customization still available for specific client needs. More power than the very expensive high end CPM systems, but at pricing and ease of use more suited to the mid-market. Do you struggle to create the polished reports your users demand? With Callisto you can stop struggling today. Define reports in Excel linked directly to your data without giving up all the Excel functionality you love. Insert rows or columns any place. Format things just the way you want. Define any calculations desired any place you want. Do you struggle to load data? No more technical work with SQL Server on the backend just to get some data into your model. With the Callisto Data Manager, simply get data into an Excel file then load it directly from that Excel file into your database. Workflow control for data submissions and approvals are so easy to define that any business user can do it. Provide predefined input form templates for your users that can be completed while online, or just as easily used offline to complete data entry any place any time. Callisto allows you to open for data input just the items you want, and close them again anytime you want. Let your users create their own input schedules or load their own data, all without fearing they might update the wrong data, and still maintaining all data submission and approval controls. Easily support multiple overlapping cycles simultaneously, so you can do things like gather Actual data for one month while simultaneously gathering Forecast data for a different set of time periods. Do you struggle to let users investigate their own data? With the Callisto drill down capabilities you can define Guided Investigations that even your least experienced users can follow to investigate all the details of their data. Those drill down investigations can even be extended into things such as SQL Server Reporting Services to allow users to continue their investigations to any level of detail available within your company. Preserve all the native Excel functionality loved by Excel users. Insert rows or columns anywhere desired and all the report dynamics continue to work while preserving all changes made. 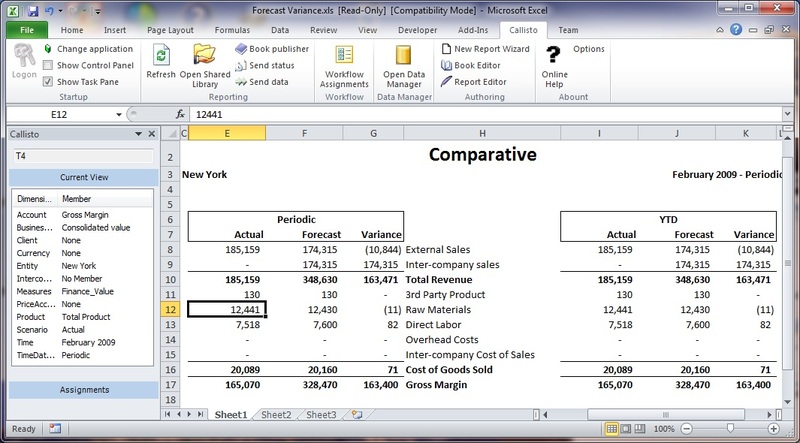 Define Excel calculations in reports. Derive input values with Excel formulas within Input Schedules. Work with your reports and input schedules online or offline with ease. Callisto works natively with your existing Microsoft platform. The clients only require Microsoft Excel. The Modeler for administrators only requires .Net 2.0 on the client. The Server only needs Windows Server and SQL Server. A pure Microsoft stack of standard, very popular, and commonly used Microsoft software. Use the Microsoft experts you already have to support your environment. No firewall problems with all client communication taking place with http. High scalability beyond other CPM solutions on the market. Run Callisto in the cloud. We have partners running Callisto in the Amazon cloud and the Microsoft cloud. Callisto offers the solution for everyone.